Prosecution insists she killed two journalists and illegally crossed the border into Russia afterwards. The Donetsk city court of Rostov Region has found Ukrainian pilot and MP Nadiya Savchenko guilty of murdering two Russian journalists, Igor Kornelyuk and Anton Voloshin, in Ukraine's Luhansk Region. "Nadiya Savchenko committed the premeditated murder of Kornelyuk and Voloshin as part of a group of people from the motives of hatred and enmity," the Russian news agency Interfax quoted Leonid Stepanenko as saying. He added that Savchenko had also illegally crossed the border into the Russian Federation. The reading of the verdict is still under way, with sentencing expected on Tuesday. The prosecution demands a 23-year prison sentence for Savchenko. The trial of Nadiya Savchenko in Russia's Donetsk on charges of murdering two Russian TV journalists in Luhansk Region and illegally crossing the border started in mid-2015. According to the case files, as a member of the voluntary battalion Aydar, she adjusted artillery fire on 17 June 2014 as a result of which the employees of the All-Russia State Television and Radio Broadcasting Company (VGTRK), Igor Kornelyuk and Anton Voloshin, were killed. Russian investigators say she then illegally crossed the border into Russia where she was arrested. According to her defence, Savchenko had been taken prisoner by militants of the self-proclaimed Luhansk People’s Republic before the shelling, during which Kornelyuk and Voloshin were killed, and she was illegally brought to Russia, where a case against her was fabricated. In early March, the hearings were to end with court debates of the sides and the final statement by the defendant. However, on 3 March, the judge suddenly deprived Nadiya Savchenko of the final statement and postponed the hearing until 6 March. The text of her statement was released nevertheless, and Savchenko went on a dry hunger strike. 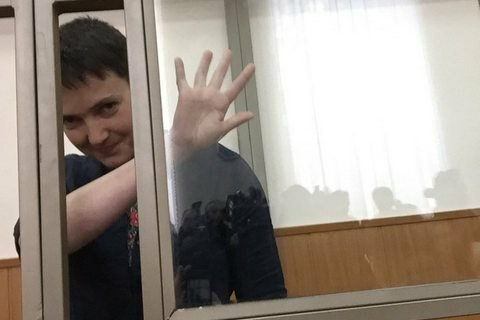 During a brief court hearing on 6 March, Savchenko made her statement and announced she would continue her hunger strike. Four days later however, Ukrainian consul-general in Rostov-on-Don Vitaliy Moskalenko and lawyer Mark Feigin managed to persuade Nadiya to stop her dry hunger strike.